De : His Holiness the Dalai Lama, Translated, Edited by Jeffrey Hopkins Ph.D.
Lu par : Jeffrey Hopkins Ph.D.
As human beings, we possess one common desire: the need for happiness and a meaningful life. According to His Holiness the Dalai Lama, the ability to find true fulfillment lies within each of us. Now, the spiritual and temporal leader of Tibet, Nobel Prize winner, and best selling author helps listeners begin the path to enlightenment in a very special audiobook - an easy-access reference for daily practice as well as a stunning new illumination of the timeless wisdom of His Holiness. How to Practice will guide you toward nurturing compassion, refraining from doing harm, maintaining mental tranquility, and how to develop wisdom. Divided into a series of distinct steps that will lead spiritual seekers of all faiths toward enlightenment, this accessible audiobook is a constant and daily companion in the quest to practice morality, meditation, and wisdom. The Dalai Lama shows us how to overcome our everyday obstacles, from feelings of anger and mistrust to jealousy, insecurity, and counterproductive thinking. Imbued with His Holiness' vivacious spirit and sense of playfulness, How to Practice offers the Dalai Lama's own sage and practical insight into the human psyche and what binds us all together. 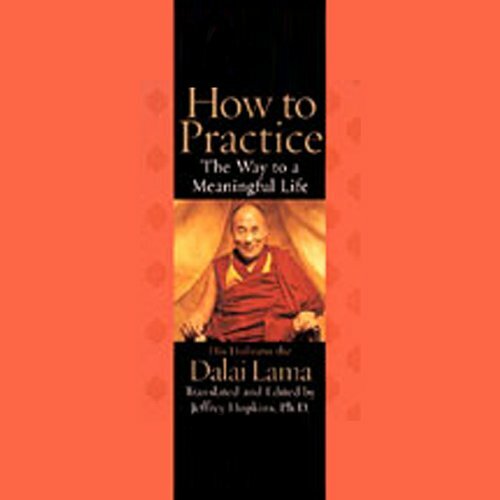 ©2002 His Holiness the Dalai Lama and Jeffrey Hopkins, All Rights Reserved (P)2002 Simon & Schuster, Inc.
my practice has risen several notches and my behaviour has been modified. What a Blessing in the truly Buddhist sense. 21 sur 21 personne(s) ont trouvé cet avis utile. I have been studying Tibetan Buddhism for about three years, and I find that the books written by the Dalai Lama are outstanding. This book is no exception. I have listened to it at least two times, and I intend to come back to it again in the future. How to practice contains explanations of many important Tibetan Buddhist practices and beleifs. It also contains brief summaries and the end of each chapter to help reinforce what you learned and to give you a roadmap for your daily practice. Although my Buddhist practice is not very advanced, I beleive that this book will benefit beginners as well as advanced practitioners. The Dalai Lama's writing style is clear and easy to understand. He is generally serious but he is not above telling a joke or two. Overall, I found this book to be extremely enjoyable. 116 sur 121 personne(s) ont trouvé cet avis utile. Maximum gain reading--the teachings about the nature of reality, clarity of explications on emptiness, the true nature of generosity and compassion, and practical to-do's--all rewards to the reader; but, the greatest reward from this book is the opening that correspondingly happens in the reader's heart as HH the 14th Dalai Lama carries you like a beloved child into the river of the Dharma. I'd say, D.T. Suzuki gave me a kick-start, Kaplau gave me a practice, and now the Dalai Lama has blessed me, initiated me, into a generosity of spirit, and helped my practice mature. I find that I no longer notice the difference between "practice" and "non-practice" for HH has shown, or instilled, a new understanding of the integrated wholeness of each moment of life. All moments are practice. I no longer wait to "sit" to practice, no longer expect my mind to be a certain way before I am "practicing." It is like finding oneself swimming somehow when before one was only able to float clinging to a log. Why do I try to put it into words? I believe the lessons of compassion are vital for our world, for our survival as a species, and for the survival of all sentient beings. This small easy to read book allows compassion to emerge. The greatest gift to me from reading this book? I am quick to forgive, quicker to give, faster to recognize my delusions and entrapment in afflictive emotions, and without a doubt I now see those around me being more compassionate to one another. Wisdom is a noble goal. Compassion a noble goal. This book sets out the way, like a child's chalk marks on a sidewalk--clear, simple, familiar already, and the periodic summaries at the end of chapters allow one to return to the lessons of the teacher over and over. You'll want to not only listen to this book over and over, but you will seek out the print version so you can have the three jewels handy beside your night table, beside your chair, your zafu! 93 sur 97 personne(s) ont trouvé cet avis utile. I loved the Dalai Lama's Art of Happiness and Karen Armstrong's Buddha, but have been disappointed in this one. The narrator speaks in a monotone and rarely shows enthusiasm for the material. While this has given me an opportunity to demonstrate compassion for a first time narrator, I also want to spare new listeners and recommend another of the Dalai Lama's works. 51 sur 53 personne(s) ont trouvé cet avis utile. His Holiness the Dalai Lama can transcend the divides that exist between humans and show us our tue nature. Much of our personal experience has taught us lessons; some that we would rather forget. But this book shows us how the difficult lessons in life can be brought together with the beautiful aspects we recognize but cannot internalize. This book shows us how to develop compassion for ourselves and others so that we can overcome the internal struggles that often lead us to a cynical view of life. The insights provided by a tibetan monk to a caucasian everyman are astonishingly valid and beneficial. While much of buddhism is, on it's surface, difficult for westerners to access, this book provides an introduction to the major philosophical insights of buddhism in a manner which is easily understood by anyone. If you are contemplative and desire to understand more about yourself and a world which seems cruel and confusing I urge you to get this book. This is a great book. It's probably not for beginners, but if you're serious about Buddhism, you'll definitely want to read this. Note the word READ. The narration of this book is TERRIBLE. Do you self a favor and pick up the old-fashioned paper copy. 36 sur 44 personne(s) ont trouvé cet avis utile. Really got to understand a great deal about how to practice and the ideologies behind the practices. Would you consider the audio edition of How to Practice to be better than the print version? I would probably prefer print. That way I can refer back to the book for reminders. What other book might you compare How to Practice to and why? What does Jeffrey Hopkins bring to the story that you wouldn’t experience if you just read the book? This book is amazing full of wisdom and spiritually. A true gem written by The Dalai Lama, narrated by Jeff Hopkins. Jeff is very good at carrying the spiritual word. His insight is great as is his translation. This is a jewel , it is very good!